The Hobbit, by J.R.R. Tolkien, is a fantasy about a creature known as a hobbit, with the name Bilbo Baggins. He is not of the adventurous sort, but when thirteen dwarves and a wizard knock on his door in need of a “burglar”, Bilbo, after much convincing, agrees to go on a quest with them, a quest to regain the dwarves’ lost home, The Kingdom Under the Mountain, which is guarded by the great Dragon Smaug. Surprises and twists lie ahead of Bilbo and his friends as they try to defeat the clever dragon under the mountain. Every time I opened this book, I was met with a certain indescribable peace. It is as if I myself am in the Shire right now, writing a book review about The Hobbit. This story contains several twists and turns, and I never knew what to expect next. From the ways of Gandalf to the terrors of Smau g, Tolkien cleverly incorporates each and every aspect into a web with a our lovely hobbit, Bilbo Baggins, at the center. Being a prelude to The Lord of the Rings, The Hobbit shows us certain aspects the series will hold, but it gives nothing away, which excites readers such as myself. In pursuit of the plot that Tolkien has compiled in this sequel series to The Hobbit, I have begun to read the Lord of The Rings, and it does not disappoint. This book is for those who fall in love with good writing and also for those who like change, as well as a sense of adventure, I must say so myself. Tolkien has done a splendid job at writing a tale worth telling by writing this book. The Last Unicorn by Peter S. Beagle depicts the emotional and perilous journey of a unicorn who seeks the truth aboutwhether or not she is the last of her kind. She encounters mortals who are both kind and selfish along her travels, and for the first time she begins to understand what it feels like to be a mortal. Each of the characters are very memorable in what they have to offer to the reader and the story, and there will be lines of dialogue that will echo in your mind for ages. I was in awe of how mature and philosophical the author portrayed the subject of unicorns, which I thought would be portrayed as a childish and playful being. This book is a favorite to me, and I would recommend it to anyone who is curious enough to read this enchanting story. 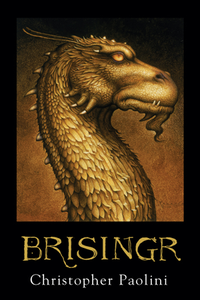 Summary: Brisingr is the third book of the trilogy: Eragon. When a 15 year old farm boy finds a dragon egg in the forest near his home village, he keeps it to see how much its worth. At first he thought it was a blue rock polished by the natural surroundings of the landscape. The story tells of Eragon’s journey across the world to find the Varden, which is a secret organization that is hidden from evil King Galbatorix’s view. Eragon becomes a legendary hero to the people and has now embarked on a new journey with his dragon Saphira and his cousin Roran. They fly to the mountain of helgrind to save Roran’s wife from the Raz’aac. These creatures were sent by Galbatorix to lure Eragon into a trap. They saved his wife and won a great battle against the king’s army. Eragon also learns much about his ancestry and he is finally told that Brom, his dragon riding teacher, was his dad. The book concludes with Eragon waiting for the battle to begin between him and the mighty Galbatorix. Who would I give it to next: Anyone that really likes adventure books. Lacking her sisters’ awe-inspiring beauty, Belle withdraws from society, devoting her time to wood carving. Secretly Belle longs to find the fabled Heartwood Tree which, if carved by the right hands, will reveal the face of one’s true love. During a fierce storm, Belle’s father stumbles upon the mysterious Heartwood and encounters a terrifying and lonely beast. Now Belle must carve the Heartwood to save her father, and learn to see not with the eyes of her mind, but with the eyes of her heart.